Few crimes shock as much as the murder by a parent of their child. At the Crown Court in Chester - before Mr Justice Roderick Evans and a jury - Iftikhar Ahmed and Farzana Ahmed were convicted of murdering their daughter Shafilea who was, in the judge's words, "a determined, able and ambitious girl." The sentencing remarks of the judge have been published via the Judiciary website. 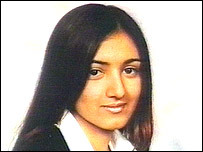 Shafilea was killed on 11th September 2003 and the killing (by suffocation) was done in front of the other children of the family. Prior to that date, Shafilea had suffered terribly at the hands of her parents - The Guardian 3rd August 2012. After the killing, the parents attempted to conceal the body and also lied to the Coroners Court. They also attempted unsuccessfully to have the verdict of unlawful killing overturned and replaced by an open verdict. Iftikhar Ahmed argued that the coroner's view was 'biased'. Sentencing had to be in accordance with the sentencing regime in force at the time of of the killing that is, the regime in force after 31st May 2002 and before 18th December 2003.
of life imprisonment but the the judge is required to fix a minimum term to be served before the offender becomes eligible to be considered for release. In deciding the minimum term, mitigating factors and aggravating factors are considered. There was little here by way of mitigation. However, the learned judge listed eight aggravating features including the fact that the killing was motivated by cultural issues. Both were sentenced to a minimum term of 25 years (less 66 days time already served in custody). The judge said that he took into account Schedule 22 Paragraph 10 of the Criminal Justice Act 2003. Schedule 22 is headed "Mandatory Life Sentences: Transitional cases" and applies where sentence is passed after 18th December 2003 but where the offence was committed before that date. In such cases, Para. 10 requires the judge to take into account the practice previously followed by Home Secretaries when they were responsible for setting the tariff in murder cases. Home Office Circular 62/2003 explained the change in sentencing practice brought about by the 2003 Act. The 25 years is a minimum term and they will not be automatically released after that time. The judge said: "
You will not be eligible to be considered for parole until you have served those 25 years in prison. When you have done so, you will not be released automatically. You will be released only when the Parole Board is satisfied that you no longer present a danger. " 25 years from now, Iftikhar Ahmed and Farzana Ahmed will be aged 77 and 74 respectively. As for the non-legal term "honour killing", I refer back to a post on this blog of 3rd August 2010 where it was noted - "In some quarters these crimes are referred to as "honour killings". This terminology ought to be deprecated. It is murder and should be referred to as that and that alone." Motivation is essentially the reason why a crime is committed. As a general rule, motive is irrelevant to liability even where the motive is "good" (e.g. as in mercy killing where the motive is to relieve extreme suffering). Islam is frequently thought of as permitting this form of killing. Any such viewpoint is utterly misguided. The Muslim Council of Britain has stated - following the sentencing of the Ahmeds - that they wish to "re-iterate that honour killings are in no way, shape or form condoned by Islam. On the contrary, Islam categorically denounces vigilantism, rather encouraging mercy, justice and the rule of law." See the Muslim Council's statement and 2003 position paper. International bodies have shown serious concern over this phenomenon - see , for example, Council of Europe March 2003. In June this year, the U.K. became the 20th member state of the Council of Europe to sign the Convention on Preventing and Combating Violence against Women and Domestic Violence - (Council of Europe Convention). Article 42 of this convention requires states to take necessary legislative or other measures to ensure that, in criminal proceedings related to violent offending; culture, custom, religion, tradition or so-called "honour" shall not be regarded as justification for such criminal acts. In December 2011, the British government consulted about the problem of "Forced Marriage" with a view to making it a criminal offence. See the Foreign and Commonwealth Office statement of 8th June 2012. At present, steps are possible as a result of the Forced Marriage (Civil Protection) Act 2007 to obtain orders in the civil courts to prevent forced marriages - see "Rights of Women" Briefing note on the 2007 Act. and the blogpost of 9th June 2012. Julian Assange ~ Quo Vadis?